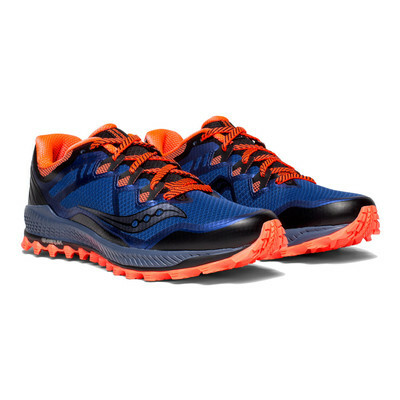 Take on the trails with comfort and confidence in the Saucony Peregrine 8. With exceptional grip and traction, a firm, assured footing will enable you to move freely over varying terrain. A smooth ride and added rebound are provided by the PWRFOAM midsole. "Fit is comfortable and I wore them straight away with no rubbing when I went for a run." "Comfortable shoe, good grip ideal for trail runing"
The upper of the Peregrine 8 has been constructed using AirMesh material to keep your feet cool and dry as you run. The mesh actively and efficiently wicks away the build-up of excess sweat and moisture to eradicate distraction or discomfort often caused by perspiration. Additionally, cool air is encouraged to circulate, creating a drier, healthier environment for your skin to thrive. As well as being highly breathable, the mesh is also durable and abrasion-resistant to keep your feet protected from debris and objects typically found when trail running. A padded tongue and heel adds to the comfort as well as guarding against friction and irritation such as chafing. 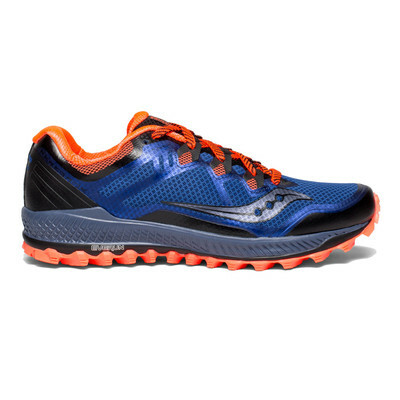 The traditional lace system offers a secure, locked-in feel as you run. Enhanced cushioning and underfoot comfort is provided by the PWRFOAM midsole. 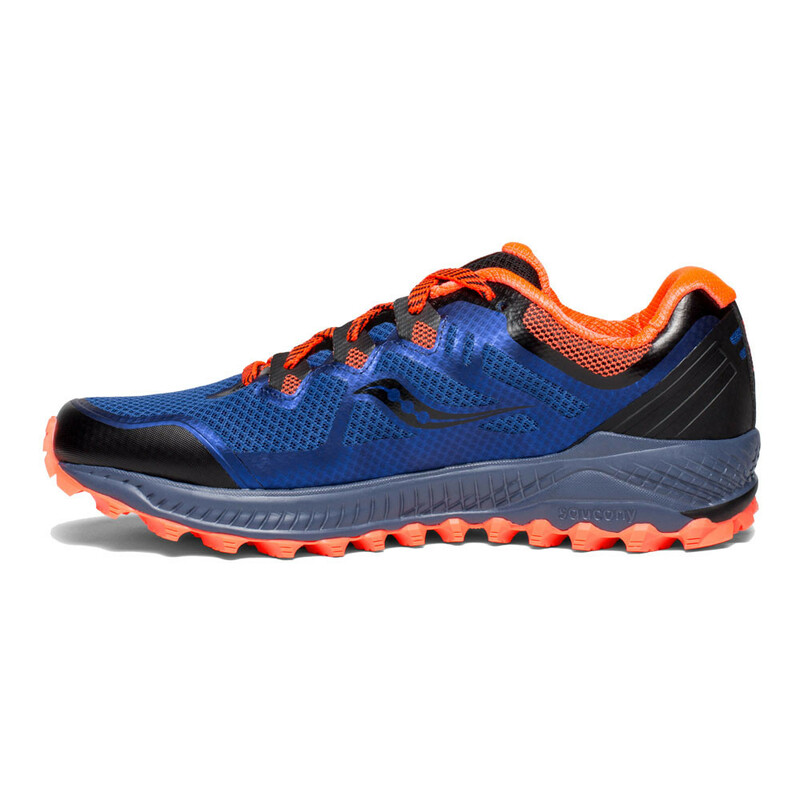 The extra responsive cushioning gives a smoother ride, especially on the difficult or unpredictable terrain. Having the ample cushioning will enable a more enjoyable, comfortable run as you can maximise both focus and performance. Working in tandem with the PWRFOAM midsole is the EVERUN topsole, giving exceptional energy return and continued cushioning throughout the run. EVERUN is livelier and more responsive, with smoother landings and stronger takeoff. A 4mm heel-to-toe offset delivers a more natural ride, letting your feet and body do more work while relying less on the shoes' cushioning and stability features. The outsole of the Saucony Peregrine 8 features an overwhelming, aggressive tread style for optimal grip and traction. 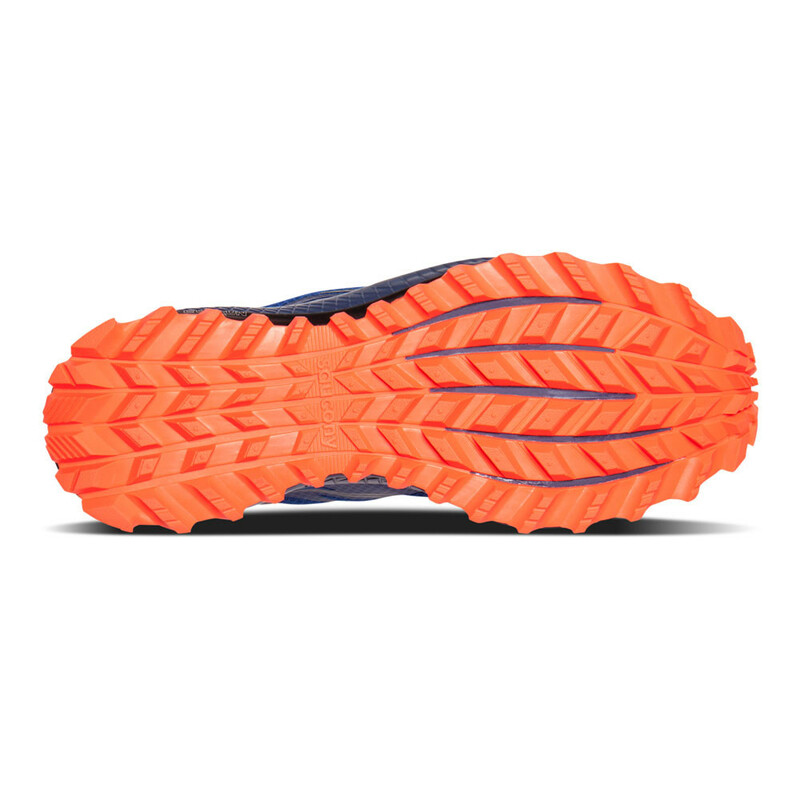 The PWRTRAC outsole offers diamond formation lugs with depth and ridges made of high traction carbon Rubber. This type of material is said to be harder than most rubbers on the market. This offers better traction on the heelstrike and rearfoot strike respectively on both dry and wet environments, thereby highlighting its versatility in variable conditions and terrains. Protective overlays and a rugged construction ensure this shoe can be worn anywhere. Abrasion-Resistant - Keeps the upper protected from debris. Padded Tongue/Heel - Sits comfortably against the skin, guarding against friction and irritation. PWRFOAM Midsole - Delivers exceptional cushioning and comfort. 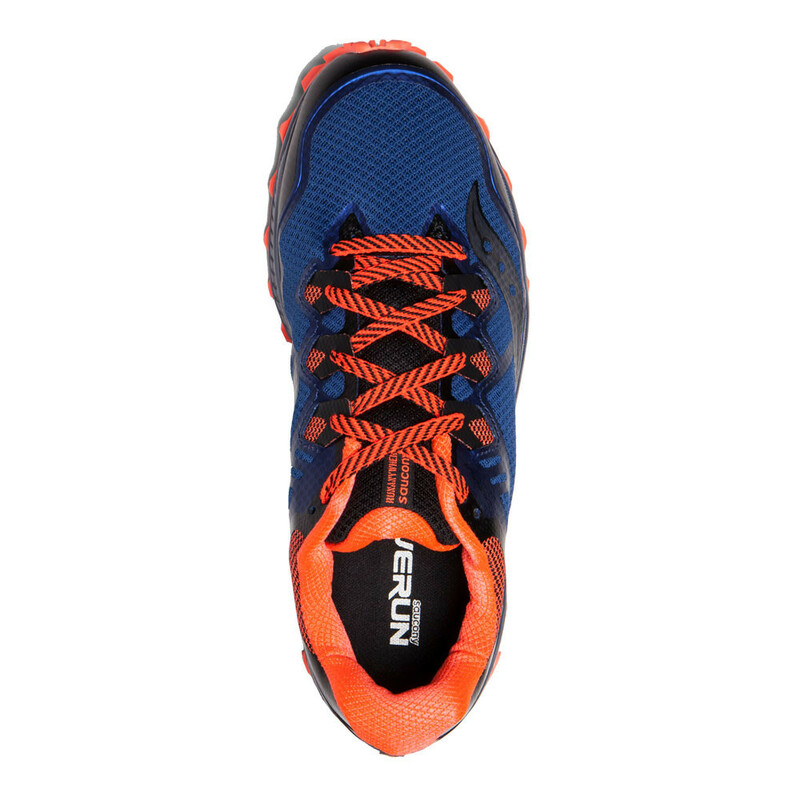 Everun Topsole - Provides plush cushioning, responsiveness and energy return. 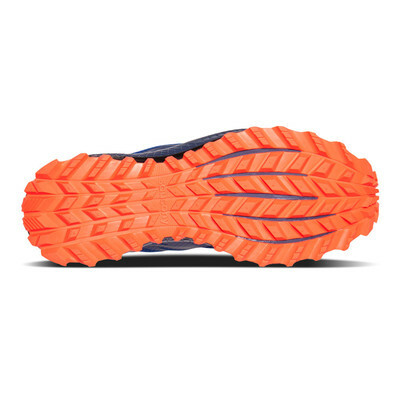 PWRTRAC Outsole - For optimal grip and traction. Aggressive Lugs - Provides a full range of motion and flexibility.